I love to linger in the memories of faraway places I visited, people I’ve met over the years, and the beauty of nature. These adventures with my hubby, I cherish. There’s many more I want to record that aren’t on the list yet! * Sunset at the top of the John Hancock Building in Chicago. * Walking the beaches of Sanibel and Captiva Islands. * Sailing 2.5 hours from Virgin Gorda to Anegada to snorkel in Loblolly Bay and sample fresh fish at one of the only restaurants on the island. * Sailing a Hobie Cat from Sandals, Negril to a deserted island and back. * Touring a coffee plantation in Kaui. * Feeding the seagulls from the ninth floor of the Holiday Inn in Folly Beach, South Carolina. Getting great photos. * Swinging from a rope at YS Falls, Whitehouse Jamaica with our friends from St. Louis. * Singing to Esmerlda, the resident parrot at the Westin in St. John. * Riding a scooter through a cemetery in Key West. * Observing a pregnant ten foot black tip reef shark with her mate, a seven foot long Caribbean off of Great Guana Cay in the Bahamas. * Diving Stingray City off the coast of Grand Cayman. * Feeding the blue tang and angelfish orange peels while diving the Wreck of the Oro Verde in Grand Cayman. *Losing our dive camera while diving the Wreck of the Tibbetts in the Caymans. Our divemaster Coco finding it in 110 feet of water! Thank you! * Getting in trouble with Security at Graceland for talking to the horses. * Watching the Kite Festival in South Padre Island. * Blue Man Group at Briarstreet Theatre in Chicago. * Being part of the last David Copperfield act in St. Louis because my sweetie gave up his spot on stage for me. * Boating to a duck blind with flying fish all around us. 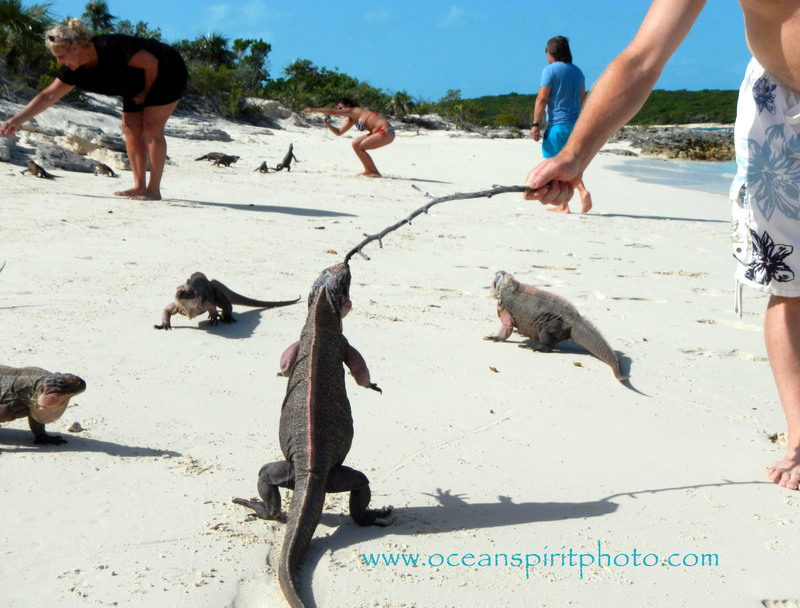 * Swimming ashore 100 yards from our rental boat with new friends to Shell Island in the Abacos. * Watching a surfer catch a wave on the north shore of Moorea. * Watching windsurfers in Pescadero, California. * Watching kiteboarders in Sorobon Bay, Bonaire. * Losing my sunglass clips-ons on the dive boat in Grand Turk. Wearing hippie bug-eye sunglasses the rest of the vacation. * Petting Chelsea the cat at the Pine Garth Inn, Union Pier Michigan. * Feasting at the best luau ever at the Kaui Coconut Plantation Hotel. 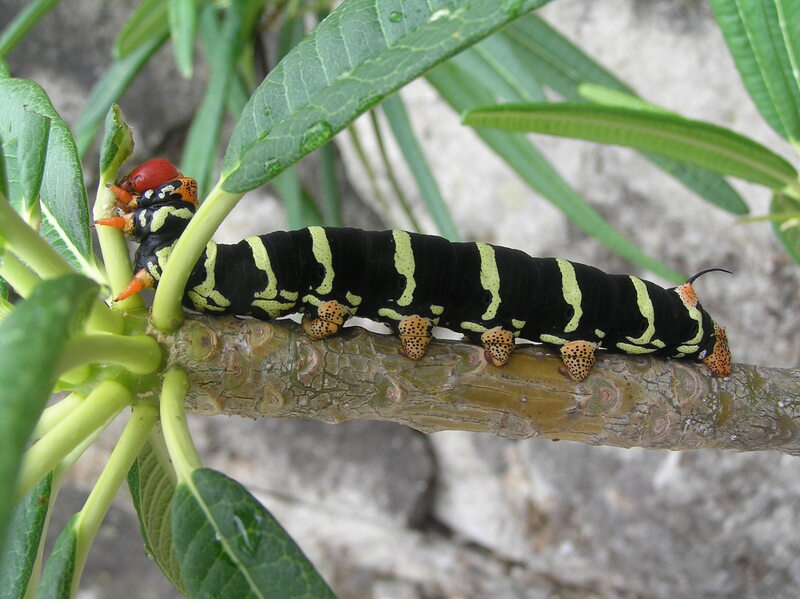 * Seeing a Frangipani Horn Worm for the first time on Moskito Island in the British Virgin Islands. * Paddling an outrigger canoe in Cook’s Bay and placing fragrant leis in the ocean in memory of your grandmother. * Breakfast at La Francais Banana Cafe in Key West. Watching the altercation with the drunken vagrant and police officer across the street. * Riding in a gondola to the top of Breckenridge. Seeing some of the tallest trees ever. Watching my soulmate ski down the mountain. 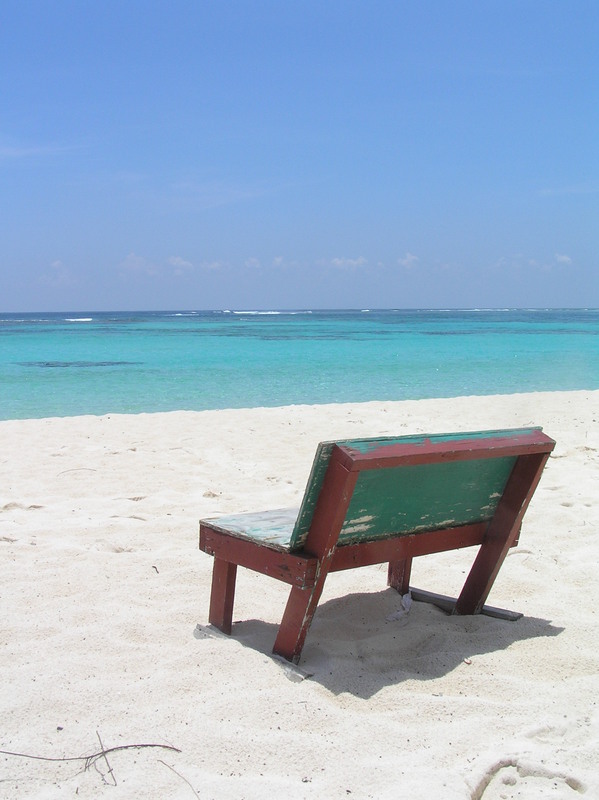 *Observing the expression on my sweetie’s face as he sees Bloody Bay Wall in the Cayman Islands for the first time. The adrenalin on the dive peering in the deep blue below and all around. * Scubadiving with Spot the dolphin in Little Cayman. * Swimming with dolphins in Folly Beach. * Observing dolphins in Sarasota and Sanibel. *Eating at Hopetown Harbor Lodge, and watching a storm bre wing. * The Hawaiian lady on the side of the road in Kaui selling handmade leis. * Newman’s Beach in California. The lagoon with mothers and their babies. Fisherman along the shore. Couples playing bocce ball in the sand. The little boy running along the rocky shoreline, crashing waves, and seaguls overhead. * Skinny-dipping in our plunge pool at the beachhouse rental in Leverick Bay. * Family vacation in Santa Rosa Beach, Florida. The sand, the sunsets. The sunsets. Did I say the sunsets? 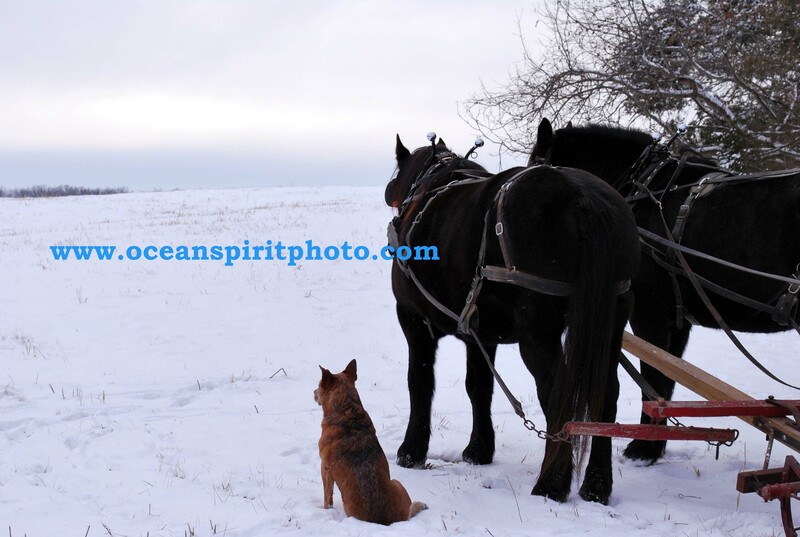 *Experiencing an authentic sleigh ride in an antique sleigh with friend and hubby at RS Ranch in Bourbon Missouri just after a new fallen snow. *Meeting Surfer Pete in Gregorytown, Eleuthera. *Eating lunch on the lawn of a beautiful home at Cotton Bay in Eleuthera (while the owners weren’t home). Yes, honey, I understood you were nervous. *Savoring shrimp and grits at Lost Dog Cafe in Folly Beach, and drinking the best Cafe Mocha ever at Black Magic Coffee Shop. *Snorkeling the South Cove at Eleuthera. *Watching a light storm in the dark at the Point House at “The Cove” Eleuthera with my honey. *Seeing a real tree frog (from the Caribbean) for the first time stuck to our sliding glass door at “The Cove”. *Snorkeling the Current Cut in the town of Current, Eleuthera. *Watching my husband ‘planking’ on Plank Street in the town of Current. *Playing with Lucky the golden retriever on Sunset Beach at Cape Eleuthera Resort. *Meeting Daisy and Bruno, two potcakes (Island Dogs), and their owner Sharon on Eleuthera. *Being threatened by an island woman in Tarpum Bay, Eleuthera. *Navigating a golf cart through the streets of Harbour Island. *Paddling a kayak from Tybee Island to Little Tybee Island as a storm b rewed. Then navigating it back in the height of the storm. *Attending the 2012 Sikaflex boat-building contest on Sturgeon Bay, Wisconsin. *Gazing at goats grazing on the roof of Al Johnson’s Swedish Restaurant in Sister Bay, Wisconsin. 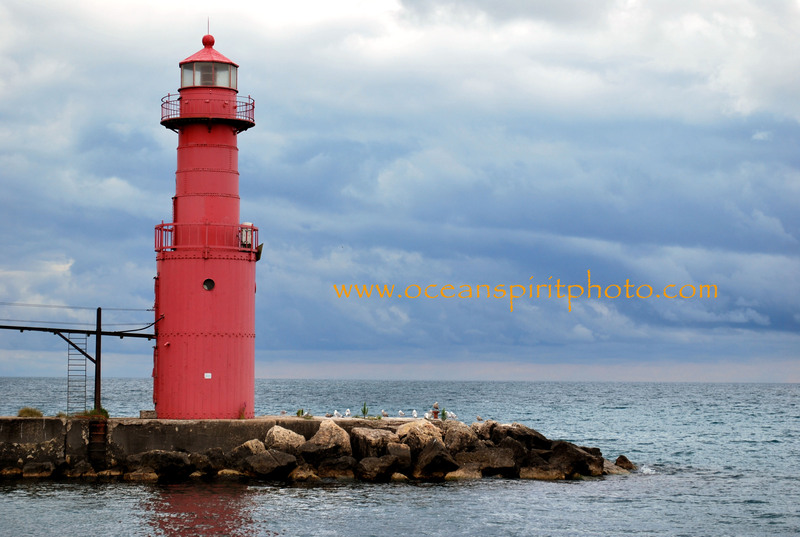 *Photographing and touring all the lighthouses open in Door County, Wisconsin, and then more on our way back to Milwaukee. *Attending a fall horse auction at Keeneland where horses sold for more than $1 million. *Meeting Michael Blowen of Old Friends Farm for Thoroughbreds, Georgetown. Stroking the beautiful manes of previous Kentucky Derby and Belmont Stakes winners. *Touring an authentic tobacco barn in Georgetown, and smelled the sweet aroma of tobacco curing. *Meeting Jean Cruget, jockey for Triple Crown winner Seattle Slew in 1977, and having a photo op with him. *Visited historic Southport, North Carolina, a former shipping town, with its quaint streets, restaurants, shop and galleries. *A photo op in front of the “Safe Haven” house featured in the Josh Dumal and Julianne Keogh film. *Walking on the shores of Bald Head Island where pirates Blackbeard and Stede Bonnet frequented hundreds of years ago. *Doing our first ‘doggie’ vacation together. *Biking to the Kindred Spirit Bench on Bird Island with two new friends. 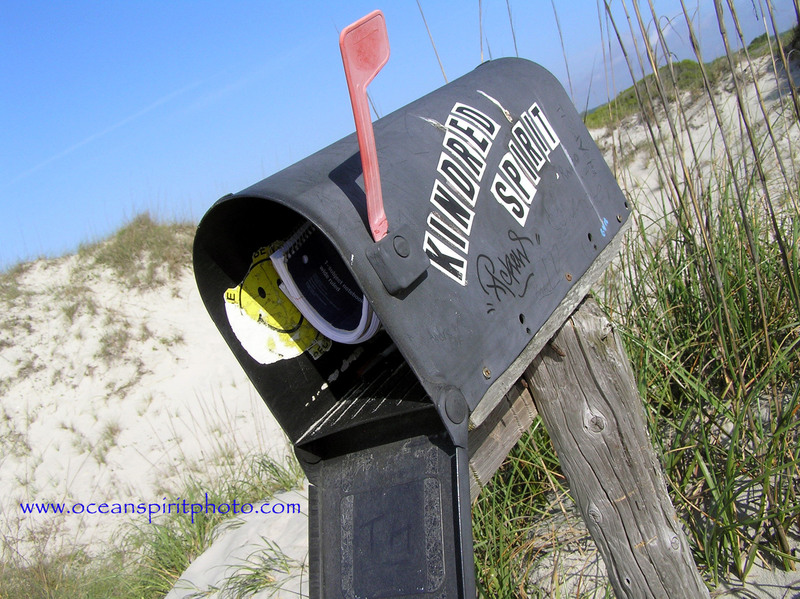 Penning my thoughts in a journal from the Kindred Spirit mailbox. *Walking to the Kindred Spirit Bench with hubby and our pooch. *Enjoying the view from the Kindred Spirit Bench with my miniature Australian Shepherd. *Watching as my husband pens his thoughts in a Kindred Spirit Journal. *Renting a beach house in Sunset Beach, North Carolina. *Attending the Little River Crab Festival in Little River, South Carolina. 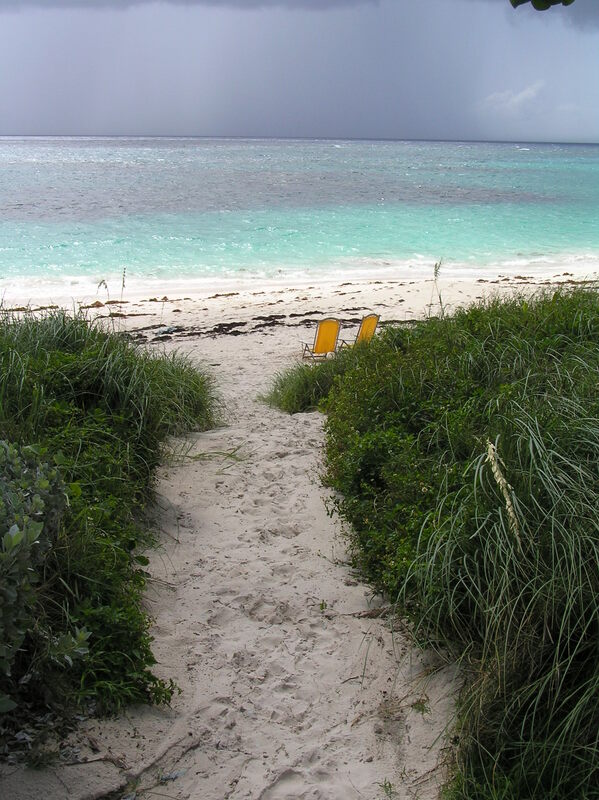 *Experiencing a luxury vacation in Exuma and Nassau. *Relaxing with a West Indian couples massage at a Red Lane Spa. *Butler service at Sandals Exuma. *Watching a limbo dancer wriggle under 4-poles of fire the height of a man’s shoe. *Drift snorkeling Farmer’s Cay in the Exumas. *Feeding iguanas grapes on Nicholas Cage’s Island. *Snorkeling the famous James Bond Thunderball Grotto in the Exuma Cays. 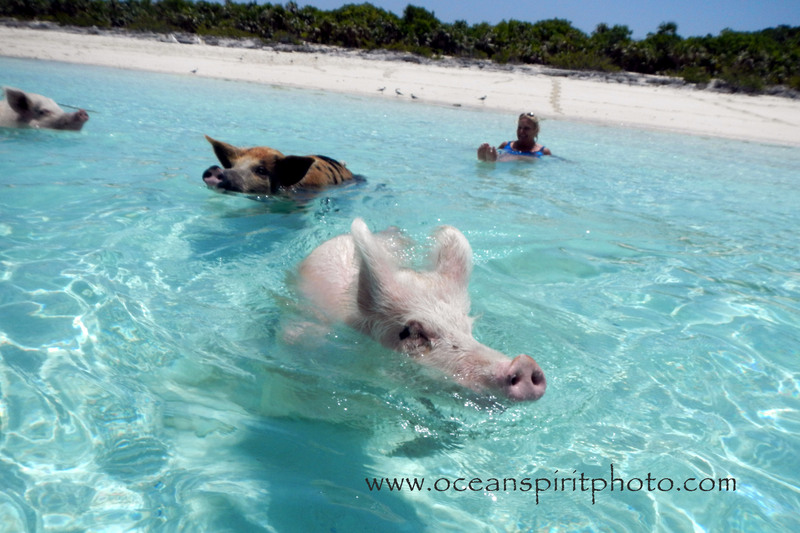 *Swimming with giant pigs (350-400 pounders) on Big Major’s Point in the Exumas. 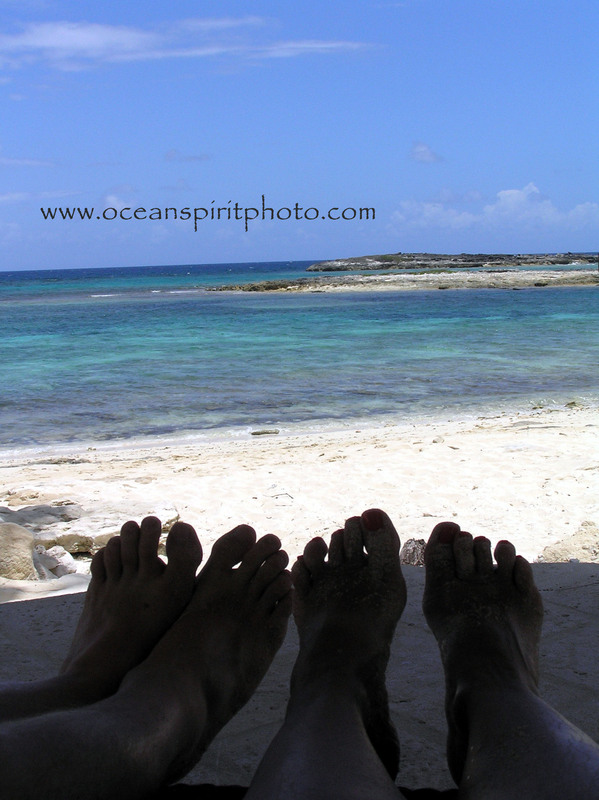 *Sinking my toes into the soft sand of Galiot Cay Sand Bar. It disappears at high tide. *Viewing cactus growing upside down in an alcove on Musha Cay. *Speeding past homes of David Copperfield, Faith Hill and Tim McGraw – on their private islands, in a fast boat. *Tasting (and savoring) fabulous cuisine at Sandals Nassau. *Spending a day on Sandals Cay with my soulmate, lazing in a private cabana, snorkeling, eating, drinking, and soaking up the sun. *Watching a Bahamian artist paint on glass while interpretive dancers add to the experience. *Enjoying butler service at Sandals Nassau. *Smiling at the flamingo show at Ardastra Gardens, Nassau. *Perusing vendors booths under the Paradise Island Bridge, and learning what dried conch looks like. *Receiving a fabulous facial at the Nassau Red Lane Spa. Wow, Sheree! I did not know you were a world traveler. Have camera, will travel. Barb, that is one of my passions. I love to travel. Sheree, you are so fortunate. We never had the funds to travel. Raising four kids sucked up everything. Monies coming in were simply passing through to doctors, dentists, retail stores, schools, etc. But it’s fun to read about your fun. Faye, I guess I haven’t taken traveling for granted. It is truly a gift.